In need of a stiff drink on Friday night, I met fellow food bloggers Ed, Jess and Penny at Der Raum for cocktails. We ended up having several, from cucumber-tinged Millers martinis disgorging clouds of liquid nitrogen (no, really) to the cocktail called Pharmacy (which involved a pill jar full of pear and roasted capsicum gin, a syringe full of Aperol and a red and white pill filled with citrus sherbet). Follow up multiple Der Raum cocktails with a Love Pho phở chaser, then Japanese beers and gin and tonics chez moi until the wee hours and you're left with several hungover food bloggers come Saturday morning. 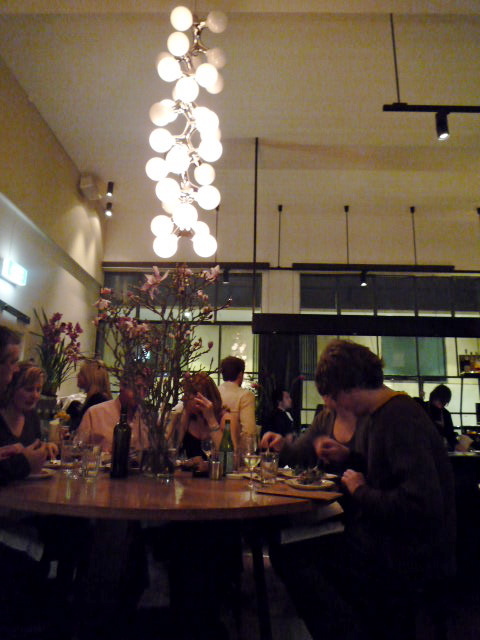 As I shuffled through the Prahran Market in a near-catatonic state, unable to make decisions re mushroom selection and wincing as trolleys scraped noisily over concrete, it was only the prospect of dinner that night at Cumulus Inc that kept me going. Oh, Cumulus! 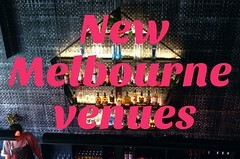 Regular readers will know that I'm an ardent fan of Andrew McConnell's CBD Eating House and Bar. I've had breakfast at Cumulus Inc several times, but the two times I'd previously visited for dinner were both over a year ago, so I was keen for a nocturnal revisit. Luckily, best-friend-K was easily talked into it (after spending all day at intensive classes for a masters subject she's doing, she was in dire need of a few drinks and a good feed). With no other commitments that night, we'd agreed that we'd be happy to wait for however long it'd take to get a table, given the no bookings policy. We got there just after 7pm and were ushered to the corner next to the coat rack, where we stood sipping on drinks and waiting... and waiting... and waiting... an hour and a half, before being seated up at the bar overlooking the kitchen. Yes it's a pain to have to wait that long (especially while standing), but mad props to the charismatic host who was doing a great job keeping the punters happy under the circumstances. 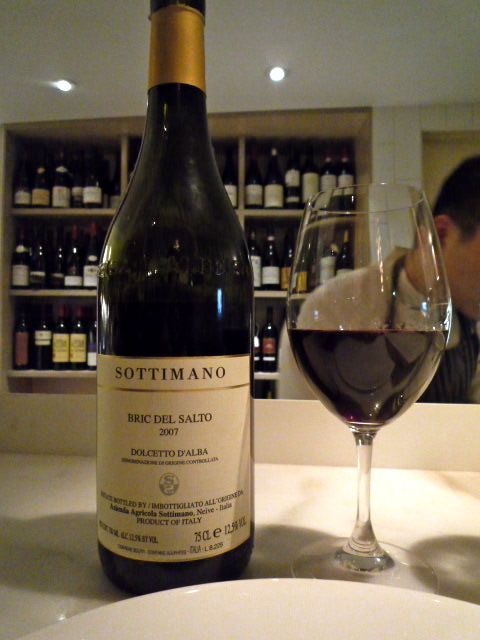 Later in the evening he dropped by to see how our meal was going, addressing us by name and chatting briefly about Piemontese wines (our 2007 Sottimano Dolcetto d'Alba, $62, was exquisite). Any flicker of irritation we'd felt at the wait was promptly snuffed out as soon as the food started arriving. 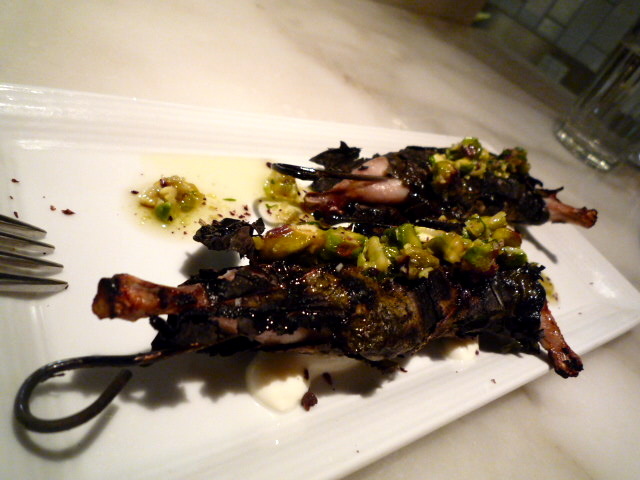 We eschewed ordering oysters this time, starting instead with grilled quail halves wrapped in vine leaf, with pistachio and labne ($7 each). Cunningly skewered and devilishly juicy. The kitchen charcuterie selection ($23). Clockwise from top left: hand cut Sicilian salami, prosciutto di Parma, wagyu bresaola with remoulade and pheasant terrine with prune. 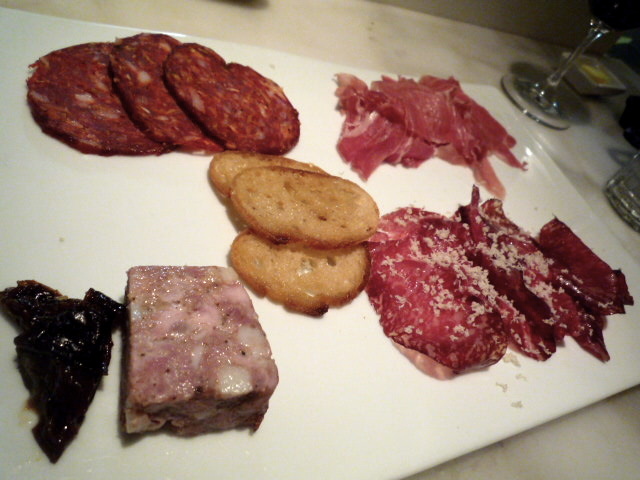 While the fennel seed-flecked salami and the prosciutto were perfectly nice, the bresaola and terrine were exceptional. I already raved about the wagyu bresaola last time: I love remoulade and bresaola, but it's the teeny tiny shavings of fresh horseradish that really make the dish memorable. And as for the pheasant terrine, the punchy gamey flavour was nicely counterbalanced by the spiced prunes. Don't know how I'll be able to resist ordering these two again next time. 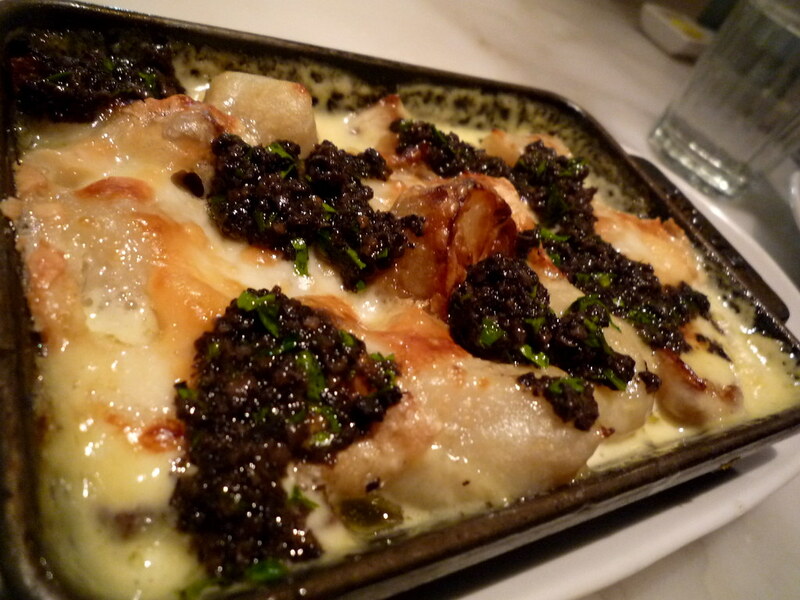 B-f-K is not much of a gnocchi fan, but I cajoled her into letting me order the baked gnocchi with Jerusalem artichokes, taleggio and truffle ($17). There is NOTHING in this dish that I don't love. Yes it was super-rich, but that's the point. Shared, it was brilliant: I couldn't decide whether I liked the enveloping softness of the cheesy gnocchi or the texture of the Jerusalem artichokes more. 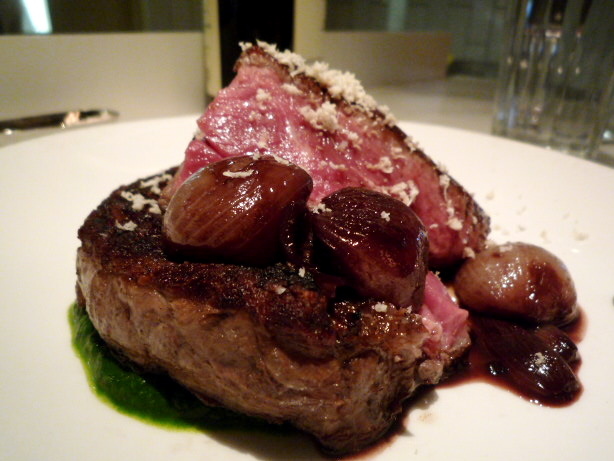 The one dish that left us a little lukewarm was the Rockdale 240 day grain fed scotch fillet, with glazed shallots, nettle and horseradish ($38). Don't get me wrong, the rare fillet had been expertly prepared... but the shaved horseradish just made me reminisce about the wagyu bresaola, and as I mentioned in the review of our first visit b-f-K is not big with the nettles. We both agreed that we should have skipped a big meat dish in favour of the cracked wheat and freekeh salad with preserved lemon and barberries that we'd enjoyed on our first visit. 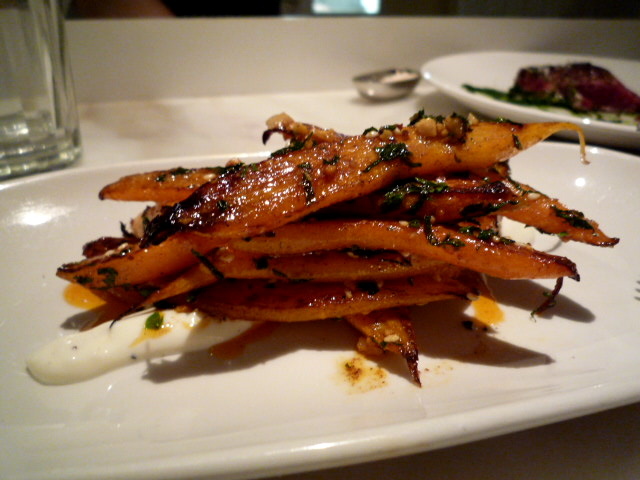 We did however both adore the special that we ordered, roasted organic (fantastically tasty) baby carrots with dukkah and labne. Because one can never have too much labne. And for dessert, we ordered the rum baba with aged rum ($17). 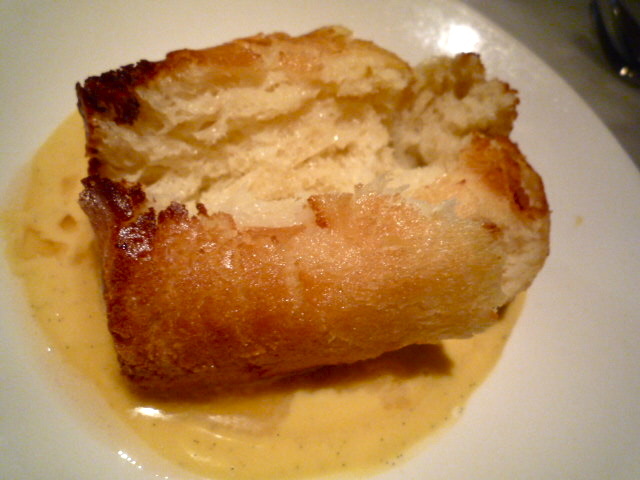 After the meal we'd had, we really ought to have settled for just a pair of lemon curd madeleines instead... but I'd had my heart set on ordering the rum baba again, ever since I tried it over a year ago at an extravagant weeknight Cumulus dinner with the charming A. When it arrived I couldn't resist clapping my hands together in appreciative glee. Taken from the oven before our eyes, the light, fluffy, briochey cake was posed in a small puddle of crème pâtissière and brought to us. It was accompanied by a bottle of 7 year old Havana Club from the bar, which was left with us so that we could pour as much or as little rum as we wanted. 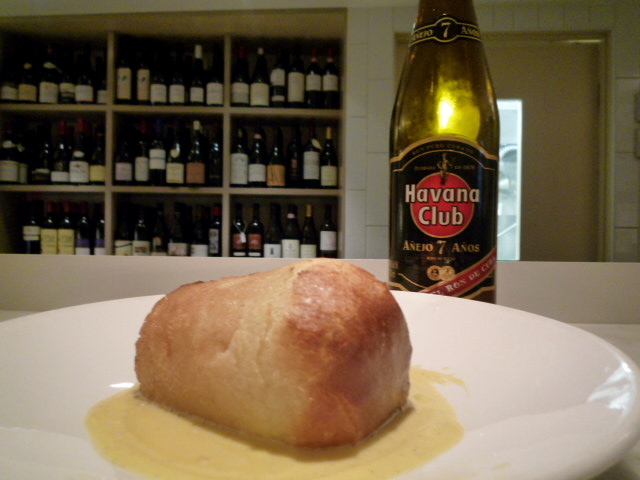 Make no mistake, the Cumulus Inc rum baba is TO DIE FOR. Oh, and at the end of the meal Andrew McConnell walked in (having finished meal service at Cutler & Co) and came over for a brief chat. I tried to remain cool and casual, but was secretly totally starstruck and geeked out that Andrew McConnell not only recognised and remembered me, but mentioned and thanked me for the write-up I did in March on the MF&WF Oyster Class. I'm such a food nerd! Oh! You make me want to go back again! I am sooo in love with the place. Maybe I should do breakfast this sat! Wanna join me? What the hell is 'labne'? Okay i am totally going to Cumulus Inc now. That rum baba looks amazing. To tell the truth I have never had a good one - often they are somehow a combination of too dry and too bitterly alcoholic. 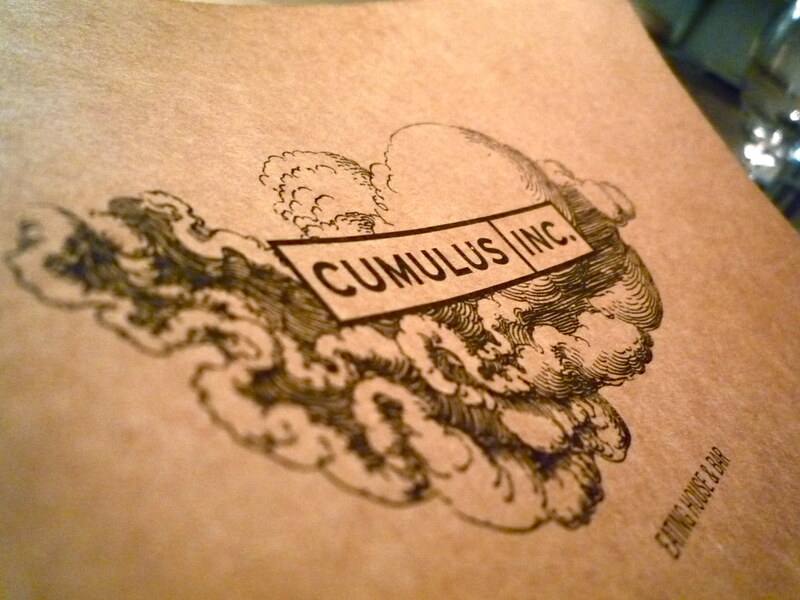 The cumulus inc logo photo looks like a tattoo. Have you got their logo tattooed somewhere on your person? The portions look great and I'm thinking about dropping in just for the rum baba on my way home. Yum! Clapping your hands with glee upon the arrvial of food? You've been spending too much time with what Wallpaper* magazine describes as "men with closely-cropped haircuts, perfectly buffed nails and subscriptions to this magazine". Thanks for the invite Penny, but on Saturday I'll be assisting my Mum in preparing a big Italian lunch for my Nonna and Nonno's wedding anniversary. But enjoy - if you haven't already had it, order the 65/65 egg! Hey Brett - well, he has met me twice: introduced a year ago at Cumulus Inc, then we spoke again in March at the oyster class, when I mentioned the blog and Andrew patiently taught me how to shuck oysters. Labne is a white Middle Eastern yoghurt cheese made from cow milk. It's awesome. 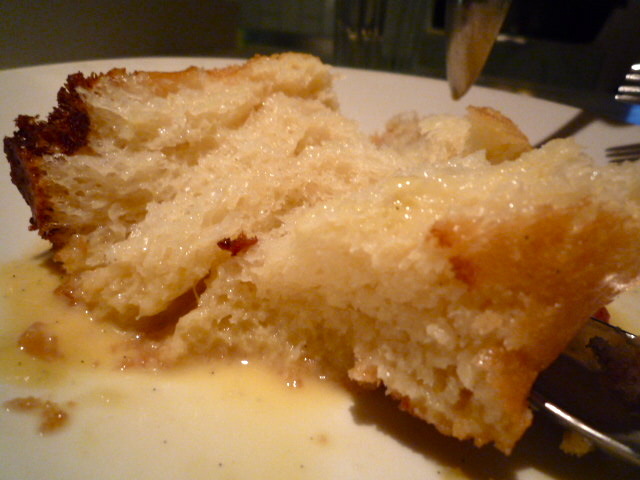 Hi Esz: the beauty of the rum baba at Cumulus is that it's fluffy (not dry), and you can make it exactly as alcoholic as you want it! 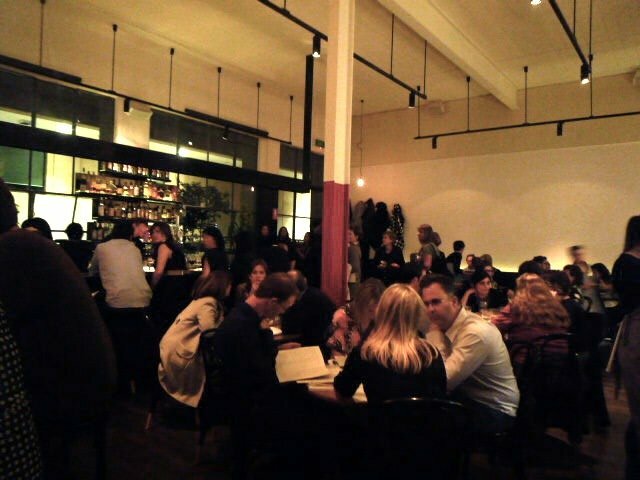 I love the quail too, anonymous! Nearly went there today, but pushed it back to next week. Definitely can't wait now! 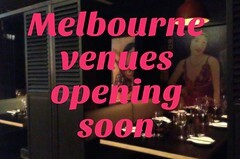 must come to Melbourne soon, I want that rum baba!!! !